In August, when we were vacationing in Austria and Germany, we took Martin to the Vienna Philharmonic. The Philharmonic was playing at the Salzburg Festival. We made a (loooong) day trip from Munich, where we were staying. The Venezuelan Gustavo Dudamel was conducting a program of Richard Strauss and René Staar, and Staar was even in attendance. Adrian, who is crazy about Dudamel, got himself into concert mood by looping Strauss’s “Also Sprach Zarathustra” endlessly in our vacation rental car. The Philharmonic adventure was the splurge of our vacation, a really big deal for us, and it meant the world to Adrian that he could bring Martin along. The morning of the performance, I helped Martin dress in a shirt, tie, and sweater vest packed especially for the occasion, and off we sped to Salzburg. To be honest, I was terrified. We couldn’t have been the only ones who considered the day a splurge (the Salzburg Festival is expensive! ), and judging from the number of fuddy-duddies in attendance, a Martin outburst would have made our family very unpopular in the Great Festival Hall. To boot, the performance was being recorded. I assume the sound engineers can edit out something like an autistic six-year-old blurting, “Can a viola play in a reggae band?” I mean, if you buy a live taping, you don’t hear the audience’s coughing or candy wrappers. Then again, we were seated in the second orchestra row, nearly under the tiny microphones suspended from the ceiling. Each time the music fell soft or paused, I tensed. Martin is not good at silence. Thank goodness we were near the side aisle. In case of emergency, I was poised to scoop Martin into my arms, make for the exit, and keep his mouth covered until we reached the safety of the ladies’ restroom. I would grab my purse on the run, so that I could use my iPhone to keep him busy until the final applause. That was my fallback plan. Minutes after Dudamel’s baton rose on the second half came Martin’s lone outburst. Throughout the concert, when Martin seemed like he might chatter, I’d been covering his mouth lightly with my palm. At once, he blurted, not too loud: “Mommy, if I talk, put your hand over my mouth!” (Which I did.) That was it. That was the worst. No way! The concert was magnificent, and Martin deserved to hear it live. The day we saw the Philharmonic was rainy. 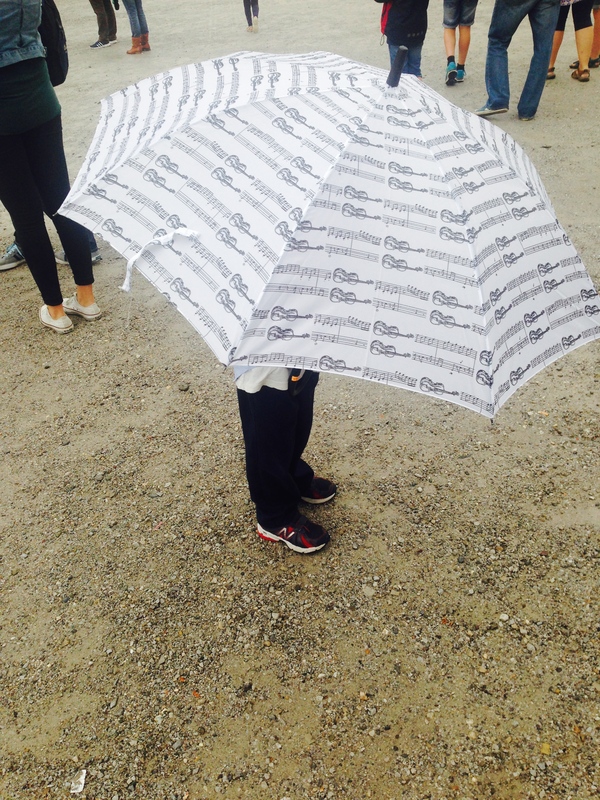 Martin got a new umbrella! This entry was posted in Life in Society and tagged ASD, autism, behavior, dudamel, munich, music, recovery, staar, strauss, vienna philharmonic by findingmykid. Bookmark the permalink.